By Sia in Internet. October 9, 2016 . 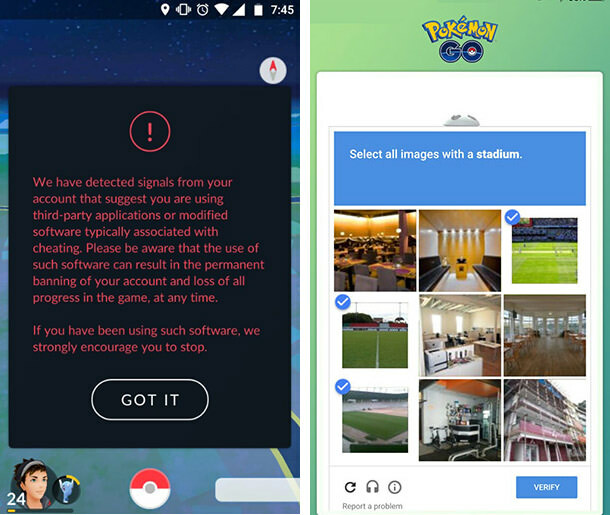 Cheating and botting in Pokémon Go is pretty common, with many relying on third party software to spoof their locations and automate the game in order to gain levels. Niantic‘s reaction towards cheating has been relatively tame so far, but that has changed on Friday, as the cheaters discovered that Niantic has silently updated the security features on the Pokémon Go servers. While the nature of the new security measures were not detailed, those who utilises such software has found that upon booting up the app, the game would throw out a dialogue box, urging the player to stop using said software as they may be perma-banned from the game. Users are also reporting that logging into Pokémon Go now comes with a Google Captcha requirement, presumably one of the many layers of security that Niantic has added to the game. Left: This box appears if Pokémon Go detects any suspected cheat software. Right: The Captcha system that appears whenever you login to Pokémon Go. We don’t really know how many third-party software and apps were affected by this recent security update, but we do know that Pokémon Go map scanner FastPokeMap and Pokémon Go botting tool PokemonGo-Bot have reported that their apps are no longer working. 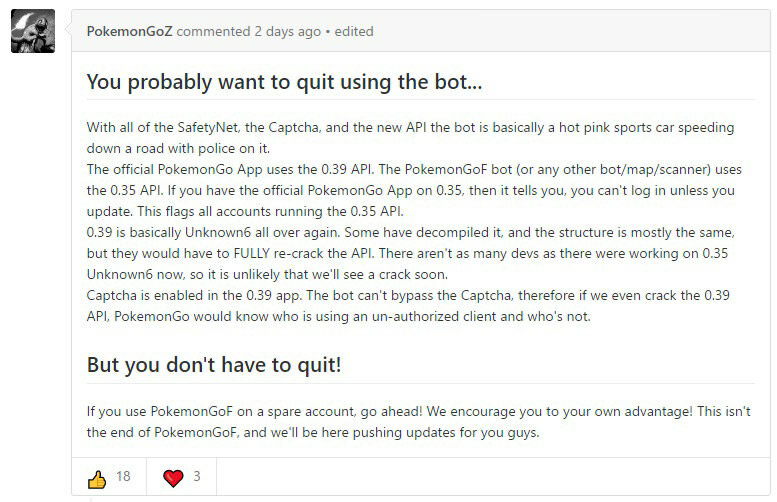 Pokemongo-bot creators advising its userbase to seize using its tools for now. Just in case you think that this marks the end of cheating in Pokémon Go, both FastPokeMap and PokemonGo-Bot have announced that they will be looking at methods to circumvent the new security features. Don't worry, remember 3august-8august? took us 5 days only to bring FPM back. This won't be as hard. In short, the arms race between Niantic and Pokémon Go cheaters have begun. If I were you, I’d sit back and watch the drama that is about to unfold over the next week or so.